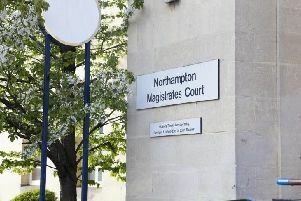 A car was badly damaged in South Holme Court, Northampton. Police are hunting for a group of men who badly damaged a car in Northampton at the weekend. The car was parked in South Holme Court, Thorplands, when a group of between five and ten men began hitting it before running off down a nearby alleyway. All of the offenders were wearing dark clothing when the incident happened between 5pm and 6pm on Saturday (July 2).